Well, it seems that the temps have sort of leveled out over the past week or so. We're talking mid-40's. Although it does dip down into the 30's...low 30's...overnight. So I've had to turn to warm beverages. Usually, I'm a big water drinker. Especially in the heat. I always have a bottle or glass or water nearby. And while I am still drinking it, I find myself longing for hot cups of coffee...steaming mugs of hot chocolate...and the scent of tea to clear my head instead. So fair warning, it's all drinks all weekend long over here. But they're perfect, toasty drinks. Entirely fitting. 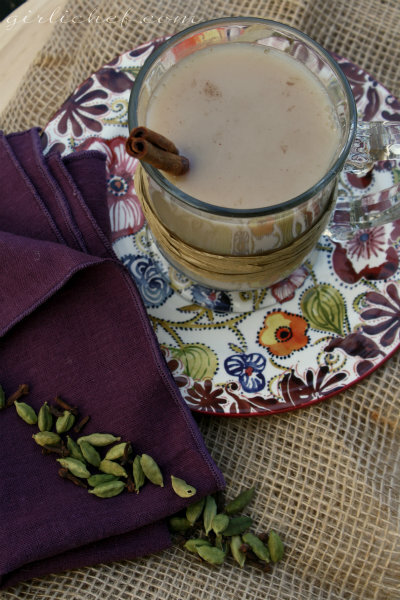 Today is just a quickie, a big mug of beautifully spiced Masala Chai. This is a very simple version that is made with just a few spices. Spices that you may already have hanging out in your spice cupboard, anyway. 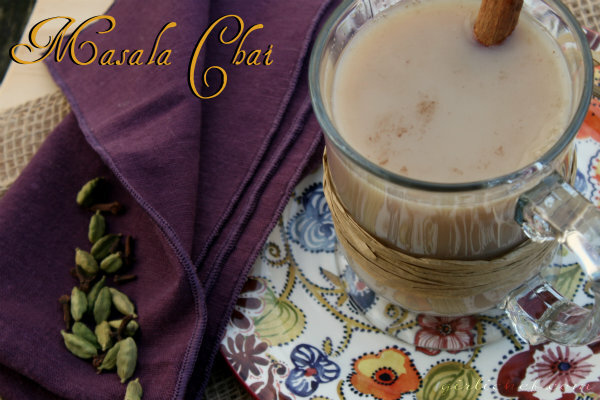 For a slightly more "involved" cup of tea, check out this Garam Chai (which just so happens to be my favorite style of chai). Place water, cinnamon, cardamom, and cloves in a saucepan and bring to a boil. Cover, reduce heat to low and let simmer for 10 minutes. Add milk and sugar and bring back to the simmer. Add tea leaves, cover, and turn off heat; let sit 2 minutes. Strain tea into 2 cups and serve right away. So, what are your favorite hot beverages...the ones that you long for on a cold, blustery day?